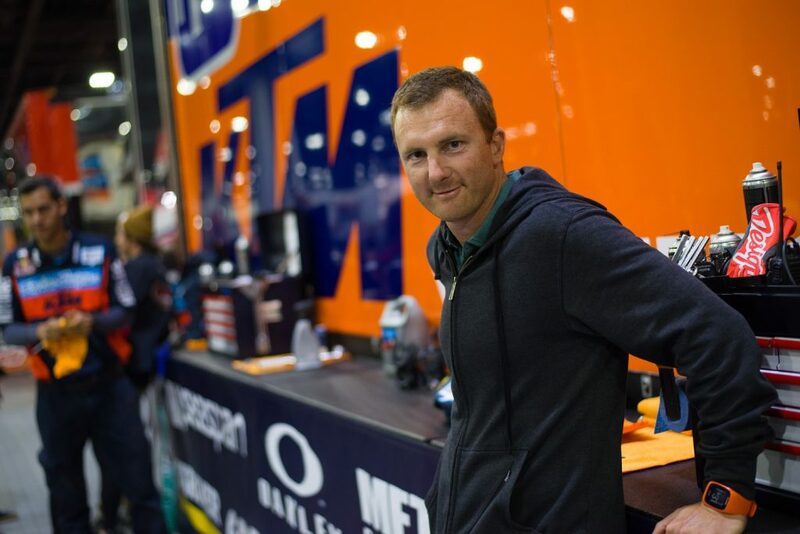 At 32 years of age Tyla Rattray does not look too different from the wide-eyed sixteen year old that made an immediate impression as a KTM rider in 125cc Grands Prix in 2001. The incredible wear-and-tear and sizeable catalog of injury in a fourteen year career means that the Florida-based father of three (with wife Sam) can sometimes feel the punishment of all those motos and dismounts. But the South African keeps a spring in his step (and a physique that indicates he could still gun a 250 4-stroke to a respectable lap-time) thanks to an alternative challenge inside the sport. In 2004 Rattray finished as world championship runner-up in MX2 with a KTM 125 SX. In 2008 he used the 4-stroke KTM 250 SX-F to claim the title and then sought further race-winning glory in the United States, earning runner-up finishes in the 250 MX series in 2010 and 2011. A dalliance in MXGP in 2014 and 2015 brought his riding days to a close but the spark with KTM thanks to the works Troy Lee Design 250 Factory Team was reignited. Rattray, who trained with Aldon Baker as an athlete, then hooked-up with the revered specialist once more … but in a different capacity. Rattray’s personal self-orientated perspective of racing has widened to incorporate five other riders, mostly on the TLD program, and from the confines of the exclusive Baker’s Factory on the east coast. There are not too many other world champions and AMA national race winners active in such a capacity in the Supercross and Motocross paddock. ‘Styla’ was renowned for his work ethic as an athlete and ‘un-showy’ approach to his racing. That he knows the hard graft necessary for the job is beyond doubt but whether he can transmit that – and all of his vast international competition experience – onto impressionable youngsters is another matter. KTM, TLD and Baker believe steadfastly in his potential but it felt timely to ask some questions. As per usual Rattray can be found friendly, accessible and open to conversation and debate. He is now a much more articulate speaker than those awkward first years in Grand Prix and the maturing effects of fatherhood and the highs-and-lows of Motocross have helped shape a rounded character. Tyla, how difficult was the transition from being a rider to a trainer? What about changing that mentality of a racer and only having to worry about one person to suddenly thinking about the surroundings of five other guys? Did having children help with that ability to get some distance from the intensity of racing? Aldon is renowned for his program and the discipline and commitment it requires. You obviously went through that and people might wonder ‘why do – or go near it – again? !’ How is the relationship between you both now? What about the mental side and the adversity of professional sport? You have your own experience but can you read or learn more to help with that aspect of the job? Do you think kids are a lot more switched on now? Can you imagine being seventeen again now and doing this? You talk about educating them on mistakes. Give an example of one you made: would it be something to do with racecraft or decision-making? Lastly is 450 SX the biggest stage for a racer? Is that what you drink-in the most as a pro? Postarea anterioară What does READY TO RACE mean to you?